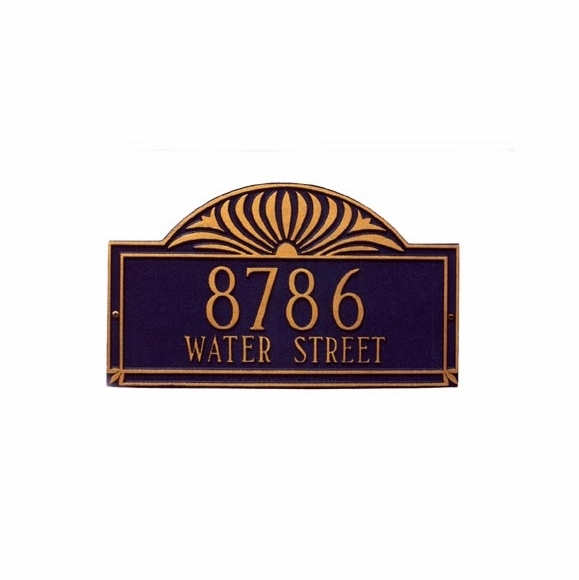 Whitehall 2004 Sunburst 16.25" x 9.5" Wall Address Marker - - accommodates two lines of text. Line 1 holds up to five (5) 3" characters. Line 2 holds up to seventeen (17) 1.25" characters. Like all Whitehall personalized address plaques, the Sunburst model is crafted from rust-free recycled aluminum. Paints have been specially formulated and weather tested to withstand the harshest elements. 5-year mfg. warranty. Made for you in the USA. Delivery time: please allow 2 to 3weeks for delivery. Great sign in the daylight and at night! Beautiful! Very nice looking and easy to read.